These popular sculptures have been been sold since 1978 in a variety of styles. 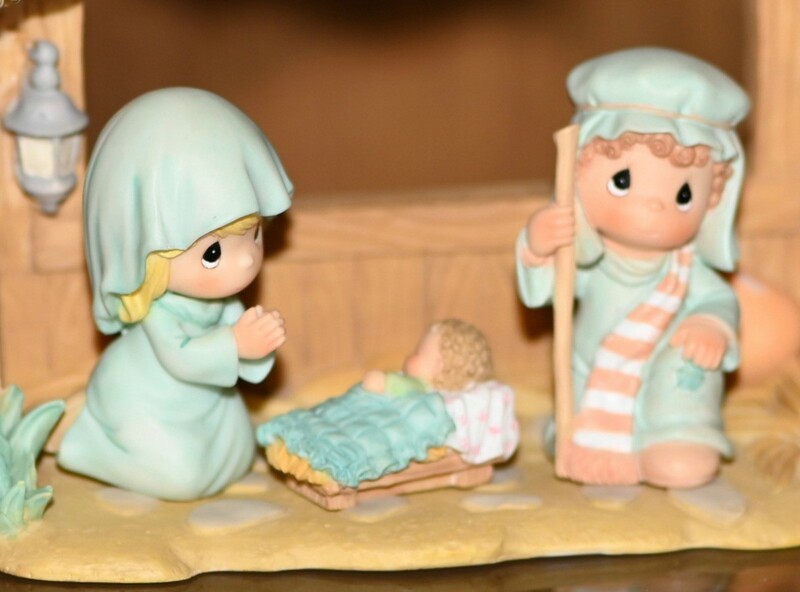 This is a guide about determining the value of Precious Moments figurines. I want to sell Precious Moment figures, does anyone know how to find the value of them without their boxes? Is there a website? If you are looking at a price at which you paid for it, not going to happen. I am one of those out there adding to my snowbaby collections etc. I just picked up 'new' boxed stuff at a garage sale for $4 per item that I know were $30+. I watch online too. It is important when you collect things to think forever when you buy them. Same thing back in the 80s when people bought these plates, sold as get your money back when you resell them. Not. So they go for a buck or two at garage sales, ebay. What one person considers a treasure, another might think dust magnet. Unfortunately there are just too many Precious Moments out there so I don't think they are that valuable. I suppose they are worth about as much as someone is willing to pay and that may not be too much :-( I too have quite a few that I don't care about now and wish I'd never collected. Ebay is great but with it came lots of competition for selling collectibles. There is just a big glut in the market now. Good luck getting a little something from them. I also see them showing up at garage sales and when they are priced real cheap they sell and if they are higher, they sit. If you have any more rare ones you might do ok with those. Checking to see the closing bids on ones on ebay should give you an idea. Do a search for the ones you have and see what they sold for. I went on retiredpreciousmoments.com and it lists the value, and their sale price. I have not compared them to closed e-bay auctions yet. We have just inherited approximately 100 figurines still in the boxes. I have no idea what they are worth. I have been told a lot are rare and limited edition items. We live in Independence Kansas. There are 3 totes full, 5' long X 18" deep X 14" H. Is there anywhere I can take them for appraisal? Precious Moments are all over the board in value. Some appreciated, some not. Having the box and original packaging adds to the value. The free way to check value is to do a search on eBay completed auctions for each piece. Be sure to match exact size, condition, and box staus. Only use sold auctions as that gives you current market value. Value is selling price + postage (knowing buyer pays postage). Never use asking price, only sold as it tells you what people will actually pay for an item. The search goes quickly, just type precious moments into the ebay search and keep it clicked on sold. Then you just chnge the figurine name. Set up a simple list with name and selling price and shipping and use that as a reference if you're planning to sell on them. With as many as you have, you could call out the high value ones and sell on their own, then sell the others in lots that add up to less than $50, which is how much insurance you get with USPS priority mail. I hope this helps get you started in valuing the collection. You have a treasure trove of lovely figurines but to assess their true value will be a very time consuming feat. Most of the figurines will probably sell for under $25 but you may also have a more valuable one in the bunch so you will have to make up your mind about either checking value of each one or blindly listing them in lots of 25-50-100. Just to give you an idea of what you are up against; there are presently over 52,000 figurines (single items/several items/lots of 10 or more) listed for sale on eBay. Over the past several months there have been over 17,000 items sold so that represents about 1/3 of the items listed as selling. This will be all prices - up and down the scale. Here are the links to eBay listings and asking prices (not true value as not sold). Here are the items sold over the past several months. Sold price in green color (unless best price chosen). This last link is a good place to start looking for your individual items - by name on the box - name must match completely. Items in boxes are always more valuable than just the figurine. You may find an appraiser in your city but they will charge you a high figure for this many items and for true value they may have to do the same thing as you - check each one out on eBay. Hiring an appraiser may take a big chunk of your potential profit so why not invest some time and keep the inherited money for yourself? Having a lot of these figurines is really not very unusual as many people have collected these over the years - usually hoping that one day some of them would be valuable. Here is an example of how some sellers sell a "lot" (more than 2 items in a listing). There are other sites that sell these figurines (Etsy for one) but none can compare with eBay sales. Etsy may have less than 10,000 items compared to eBay's 52,000 listings. eBay always has the largest number of sales of items like this. You can also think about listings some of your items on Craigslist as there are usually no fees charged to private individual sellers. Here is one sites discussion about the value of these figurines. as far as taking them for appraisal it never hurts to try going to an antiques dealer or vintage toy shop to see what they say. A cursory online search for a place does not show me much. According to this article, shops are not interested in these things www.thestreet.com/.../5-completely-worthless-collectibles... "There are three kinds of items antiques dealers and consignment shops simply refuse to accept: Norman Rockwell plates, Precious Moments figurines and Beanie Babies." If your idea is to monetize them, thank your relative for giving you an instant ebay store. YOu now occupy a very specific niche.